1990's Guardians of the Galaxy Series Review! You are here: Home / Featured / Guardians Week #2: 90’s Guardians of the Galaxy Ongoing Series! Guardians Week #2: 90’s Guardians of the Galaxy Ongoing Series! Following radio silence for nearly the entire 1980’s, the Guardians of the Galaxy returned with a new solo series written and drawn by Jim Valentino in 1990. Unlike Keith Giffen, Dan Abnett and Andy Lanning, who would resurrect the Guardians of the Galaxy in 2008 with a retooled roster for the modern era , Valentino looked at the Guardian’s classic roster and liked what he saw. 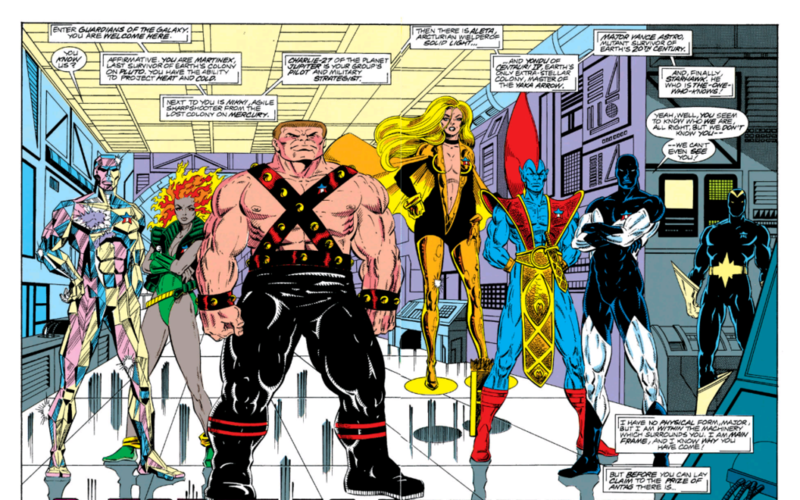 As a result, the 90’s Guardians roster consists of Vance Astro, Nikki, Charlie-27, Yondu, Martinex, and Starhawk/Aletta. Valentino’s Guardians is intensely true to the source material, referencing the team’s founding principles established in 1968’s Marvel Super-Heroes #18, as well as the developments from the team’s appearances in Marvel Presents #3 to #12 (particularly the additions of Nikki and Aletta). Even more spectacularly, Valentino’s first arc includes obsessively detailed history of the Guardians and the Marvel Universe leading up to this point, including suggested reading lists in the letters pages! Marvel could learn a thing or two about new series accessibility from their own approach to launching Guardians in 1990. For my money, if you’re going to read any classic Guardians roster books, you should try Valentino’s first 30 issues on the 1990 Guardians. Removed from 70’s team-up status, and given a full comic book run to flesh out the team, the classic Guardians roster is developed into a living breathing entity, complete with the squabbles and small moments of kindness in books like Marvel’s X-Men. Yondu grows from the world’s coolest whistling Mohawk to a trained mystic struggling with his spirituality. Meanwhile, Charlie-27 is military strategy, bravado, and unrequited love. Vance Astro, aka Major Victory, settles in as a living, breathing testament to the legacy of Captain America’s virtues. The decision to feature the protectors of the innocent in Marvel’s 3000 A.D. predates Marvel’s future-flung 2099 series by about 2 years. Marvel 2099 gets most of the future Marvel U accolades, but honestly Jim Valentino’s 3014 A.D. is incredibly comprehensive and inventive. For Marvel fans, this is Valentino’s true hook, tying the Guardians conflicts to a long, detailed history of the Marvel Universe. For example, the first arc alone finds the Guardians on the hunt for Captain America’s shield (launched into space by Doctor Doom so the invading Martians couldn’t have the weapon of such a worthwhile adversary! ), and facing off against a technologically advanced race known as The Starks exploiting Iron Man’s designs. Throughout Guardians of the Galaxy, Valentino ties Marvel 3000 A.D. to the concepts of Earth’s old heroes, rather than simply providing 3000 A.D.’s “Spider-Man,” as 2099 would do later. The legacy of Wolverine is found in a tyrannical Mutant colony worshiping Magneto, and in his sadistic daughter Rancor. The legacy of the Punisher becomes a movement on Earth 3000 A.D., with weaponized mobs taking the “punish” ethos to its inevitable darker ends. One of the best examples of seamlessly tying the Guardians to “old” Earth hero concepts comes with the Spirit of Vengeance, aka Ghost Rider, on a quest to stop Jim Starlin’s Universal Church of Truth. If every Ghost Rider vehicle design came equipped with skull tusks this big, I’d never complain about the character again. After Valentino left the series, the Guardians creative teams would explore more familiar faces somehow still around in Marvel 3000 A.D., with Dr. Strange, Doctor Doom, and Wonder Man all playing varying roles. The series would also go on to crossover with Jim Starlin’s Infinity Gauntlet follow-up, Infinity War, with the Guardians of the Galaxy traveling to present day Avengers Mansion and facing off against a Masters of Evil formed by Doctor Octopus! Until recently, this was a lost gem of Marvel Comics in the 90’s. Valentino’s writing and art don’t conform to the creeping influence of Rob Liefeld and Jim Lee as much as many other Marvel Comics of the time period, keeping Guardians more heavily influenced by 70’s bronze age than the impending X-Men obsessed 90’s. It’s not required back-up reading by any measure, but if you want to understand the classic Guardians roster, which will be referenced in more modern Guardians stories, I’d check out this run. Also a good read if you just like future versions of what the Marvel Universe might become. Nope, but this is the most Yondu you’ll find anywhere! While there’s some great stuff like Dr. 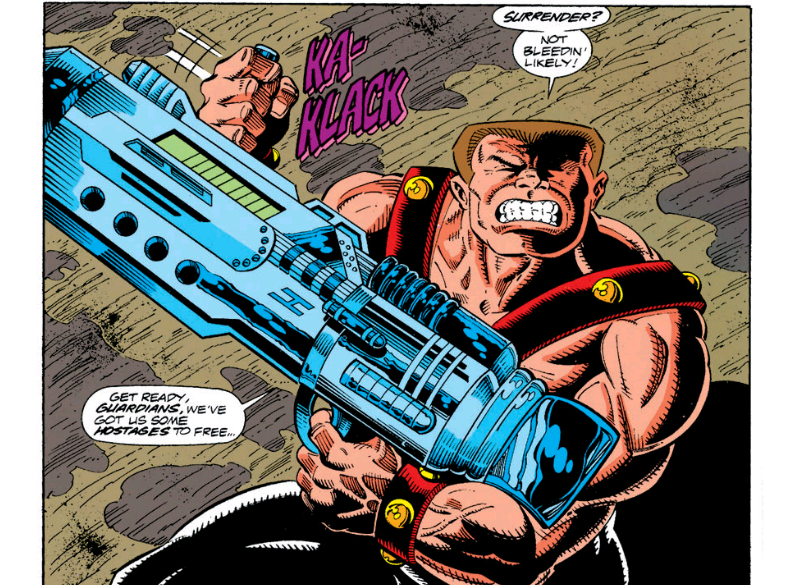 Strange showing up as The Ancient One, and a villain named Taserface, nothing beats Charlie-27 engaging in a massive gun-off with Cable for largest weapon of the 90’s. It’s only in recent years that this 60 plus issue run of Guardians has achieved any sort of acknowledgment, clearly influencing later storylines in Abnett and Lanning’s Guardians. Growing awareness has also led to Marvel NOW! era titles like Guardians 3000 . Modern Marvel Cosmic and the Guardians of the Galaxy roster you know and love launches out of Annihilation Conquest! Huh, I re-read Infinity War last year as part of My Marvelous Year and thought I read all the tie-ins as well, but I missed the Guardians of the Galaxy issues. Looks like they got added to Marvel Unlimited just a little bit too recently!